Earlier this year, I wrote a blog post about how 2D gel analysis with Progenesis SameSpots can be used to develop reliable ELISA assays for monitoring host-cell protein (HCP) contamination during production of biologics. An example has been published by Edward Savino and others at Centocor Research and Development Inc. (known as Janssen Biotch Inc. since June 2011) in BioProcess InternationalTM . 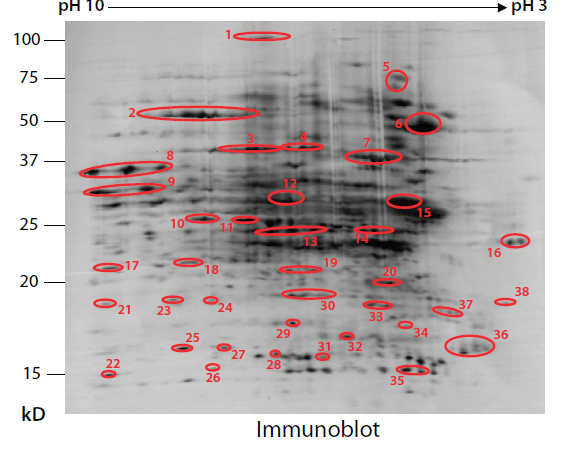 It demonstrates the application of 2D gels compared to Western Blots to measure ELISA antibodyreactivity to HCP contamination in the production of a biologic approved for treatment of rheumatoid arthritis. At an early stage of the ELISA assay development, two sets of gels were run to separate the proteins within the host cell line used to generate the biologic product. One set was stained and visualised using Silver Stain; the other set was blotted onto PVDF membranes then probed using a rabbit anti-HCP antibody generated in-house. 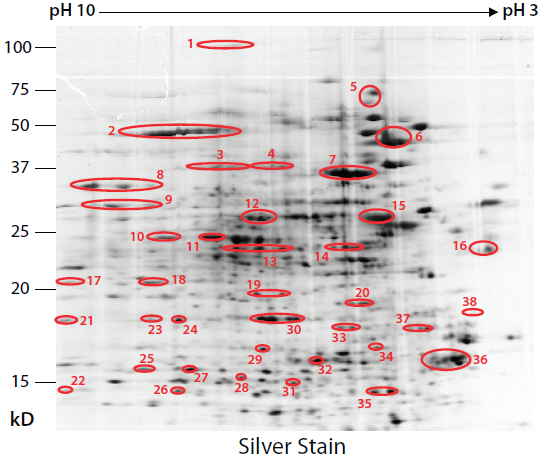 Characterisation of anti-host cell protein antibody for reactivity detected on a Western Blot compared to proteins from a host cell lysate detected on a silver stained 2D gel1. Common spots are highlighted and numbered in red. Protein spots on the Western Blot were aligned to protein spots detected on the 2D gel using Progenesis SameSpots. 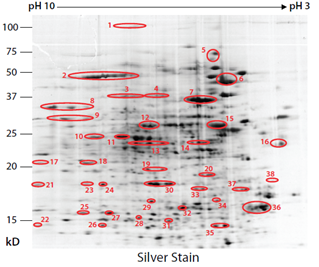 The result was 369 spots quantified on the immunoblot compared to 423 spots quantified on the silver stained gel. This showed 87% antibody reactivity to host-cell proteins, which they concluded was of suitable quality for their ELISA assay. The published work goes on to show how the ELISA antibody was used to measure effective HCP clearance at different stages of the production process. Because each biologic is produced using a specific host cell system and manufacturing process, the principles of developing a unique ELISA assay described here can be applied to other cases. Download Progenesis SameSpots and you can see how it can help to develop the assays you need to QC biologic production within your own processes. You get six free image licences, allowing you to perform a pilot study running three 2D gels compared to three Western Blots. If you need to help with the image analysis get in touch and we’ll be happy to run through this with you. 1. Edward Savino, Bing Hu, Jason Sellers, Andrea Sobjak, Nathan Majewski, Sandra Fenton and Tong-Yuan Yang. Development of an In-House, Process-Specific ELISA for Detecting HCP in a Therapeutic Antibody, Part 1. BioProcess International Vol. 9, No. 3, March 2011 pp38-47. This entry was written by Paddy Lavery, posted on November 7, 2011 at 2:00 am, filed under November 2011 and tagged Progenesis SameSpots. Bookmark the permalink. Follow any comments here with the RSS feed for this post. Post a comment or leave a trackback: Trackback URL.